These new mirrored beads delight me so I thought I’d share them with you. I’ve always been drawn to Shisha embroidery (you know, those wonderful textiles with mirrors). Seeing how Maria Airoldi applied small nail glitter pieces to her beads gave me big ideas. All that I learned about working small and intensely in the Cynthia Toops’ class was brought to bear on this project. Thin cane slices were individually applied to a black bead. I felt like I’d hit a new vein of creativity. The small hexagonal pieces of glitter bake tightly onto the raw clay with no adhesive necessary. Cynthia Toops’ faux heishi beads are cut from thin sheets of baked clay with a paper punch. 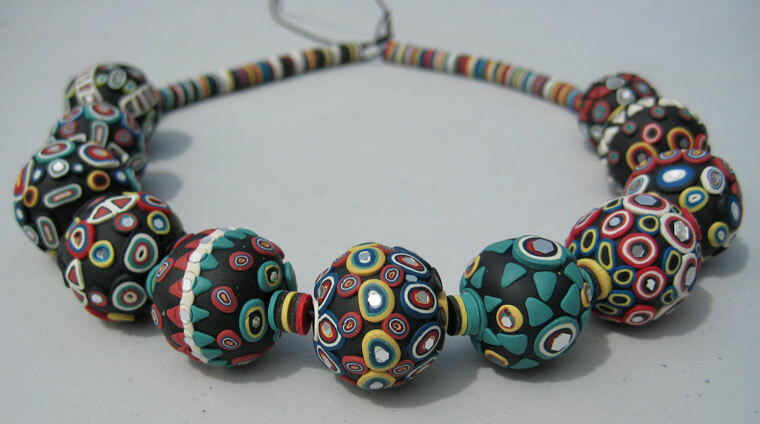 These beads represent a collaboration of many ideas from artists around the world. Dayle Doroshow will draw a random number for the book giveaway (see Tuesday’s post) on Friday afternoon. We love all the comments! Thanks. It is always fun when you show us your own work, Cynthia. I suspect that we are of similar age — I remember wearing clothes with mirrored embroidery as a teen! I love your site…You are so wonderful to always have a new posting, I look forward to it every day first thing and wonder why so few artists do that…Thanks! Love this idea. Have seen the large hexagonal glitter and thought hmmmm what to do with it! Now I know. Gorgeous beads! Love the colors. doesn’t have any BUT I was surprised to find them selling tiny cane slices to apply to finger nails. Kitkraft.biz has them. I’m looking for more sizes. Ideas? what are they actually called or the product name ? Wow these are amazing what a great idea to use the glitter with the beads I bet they look lovely in real life with all that sparkle! Wow! Refreshing tonsee something new and different. LOVE the little mirrors! I agree with the others – any info on their whereabouts, mfgrs or importers would be greatly appreciated! I teach classes to beginners and these people get bored so quickly. Any tiny uniqueness wouls send them on a trip that would keep them from harassing me about Fimo being hard to condition! Thanks for your ever-flowing trip of uniqueness! Don’t ever stop! So so magnificent, Cynthia. They look fantastic strung up. It all comes together so well. I hope you are wearing these if I see you some time!! !